Last week was the first week of Team Challenge training. I really didn’t know what to expect. We were spending the first part of the meet up to have a shoe and apparel clinic to make sure everyone has the proper gear to run or walk a half marathon. I just happen to be a gear junkie so I already had everything they showed, seriously every little thing, from the proper socks, gus, and foam rollers. I probably should do a post on my favorite gear, but since I’m no expert I’ll probably wait a little while longer on that one. After the gear clinic it was time to run. As a group we warmed up and then they split us into groups based on speed. The group was doing 2 miles since it is the first time training for a lot of my team members. Since I’ve been running based of the plan I have with Tina, I was scheduled for 6 miles. I really wanted to go at my long run pace, but since the group didn’t have a lot of speedy runners I got put in the 9-10 min mile group. So I haven’t talked much about speed recently, mostly because I haven’t talked about the training I’ve been doing in the last month or so since being in Atlanta. When I do my longer runs I’m definitely in the 12 minute mile range, sometimes a little faster, sometimes a little slower. It really depends on where I’m running and how ridiculously hot and humid it is. If we’re adding hills into the mix it’s definitely more of a 13 min mile. So this whole 9-10 min mile is more my tempo range, which is usually around 10 min miles and on a treadmill I can push it for a few minutes to get the high 9 min range. From all this prefacing you can only imagine how those 6 miles went for me, basically they didn’t happen. We were running on a busy Atlanta street so the heat from the cars will add to my excuse for why I only did the 2 miles with the group on Saturday and did 4 miles on my own on Sunday. The pace was just too fast for me and I didn’t want to get all crazy in front of the group about not being able to do it. So I ran the two miles as fast as I could, my right Achilles started hurting about half way through and that’s when I decided that it was just going to be 2 miles for me. It’s hard to join a group when you don’t know anyone and you’re all at different levels. Yes I’ve been running for 8 months, but I’m still a beginner in my mind (and should be considered that in your mind too). I think because I run regularly people in the group think I’m some crazy good runner, plus being a gear junkie makes me look like I know what I’m doing. But I don’t, the runs I do are given to me in a plan by Tina and I just follow them. Sure I give her input of what I like and don’t like and how my body reacts to different things, but I really just do what is on my plan. I just think people have higher expectations of me and I hate disappointing people. But I think I just need to find a way to say nicely, please don’t make me run too fast, I’m going to burn out! I’m currently running 15 miles a week! Which to me is high and I really just got to this number in the last week or so. I know that number is only going to grow as half marathon training really kicks up in the next week or so, but my body is definitely sore and adjusting to the increase. I just need to let them know that I’m doing a slightly different training plan and have incorporated speed work on other days. Joining Team Challenge is a HUGE step out of my comfort zone. I’m surprisingly more shy then people might realize. Yes I can talk a lot and when I have to I speak up I do, but really I don’t like to. I’d much rather observe a group and figure out all the different members before I’ll get comfortable and open up. My Team Challenge members come from a wide variety of backgrounds and I know no one in the group. I’m slowly trying to get to know the people in the group, but it’s not easy for me. I also don’t like small talk, so it makes it more difficult to start conversations with people. I don’t want to appear standoffish so I’m trying to work on my small talk. The other huge difficulty for me is fundraising. I really hate hate hate asking people for money (unless its my mom and dad, but they’re obligated to help out their favorite daughter). I don’t even know how to approach fund raising and if we’re friends in real life, you’ll probably get to experience the awkward um yes running for charity want to donate conversation, facebook message or email, that will be heading your way soon. If you would like to avoid that you can donate HERE. 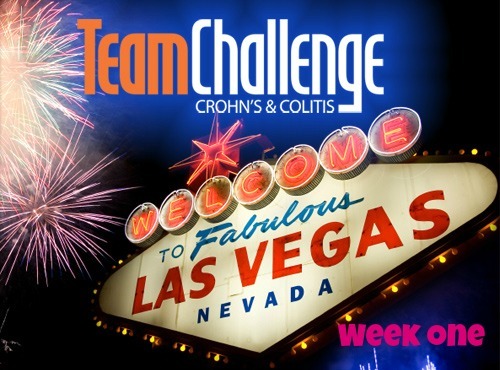 Overall I survived week one of Team Challenge! I know once I get settled into the group things will be easier and hopefully fundraising will become easier for me. So far I’ve had three donations and I’m 6% to my goal of $2,700.